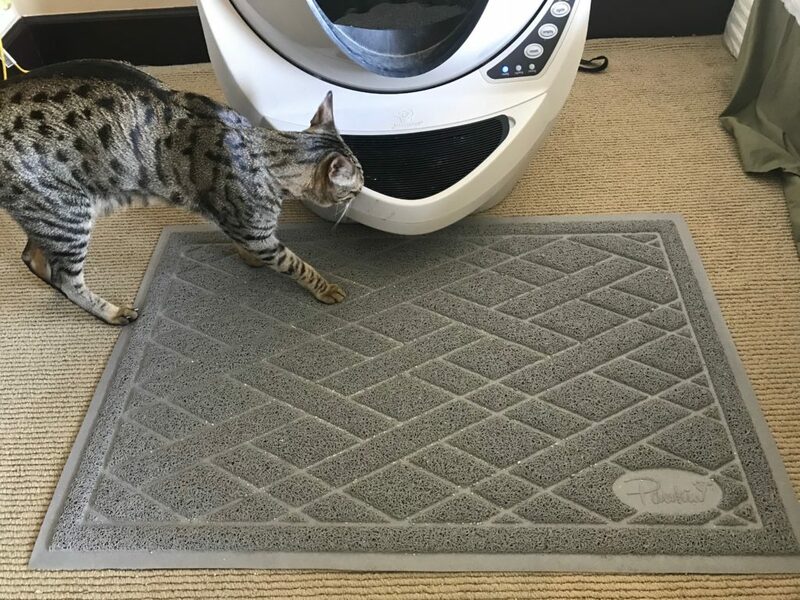 The Pawkin Cat Litter Mat uses a patented Little Lock Mesh that is designed to lock in litter and easily release it when shaken or vacuumed. We’ve been using this litter mat for over a year and can attest to these design claims. This litter mat is thicker and does a better job at trapping litter than some of the competition. The Pawkin Cat Litter Mat is sturdy enough to roll up and shake the litter loose in the litter box or trash. Cats tend to have pretty sensitive paws. You’ll definitely want to make sure your litter mat is soft enough that your cats will actually use it. Some of the cheaper designed mats are rough and scratchy-feeling. 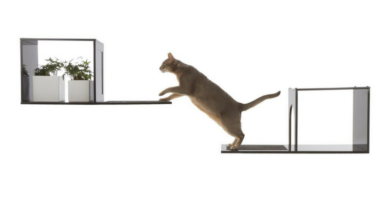 You’ll quickly regret getting one of these mats when your cat starts avoiding the litter box or jumping entirely over the mat. 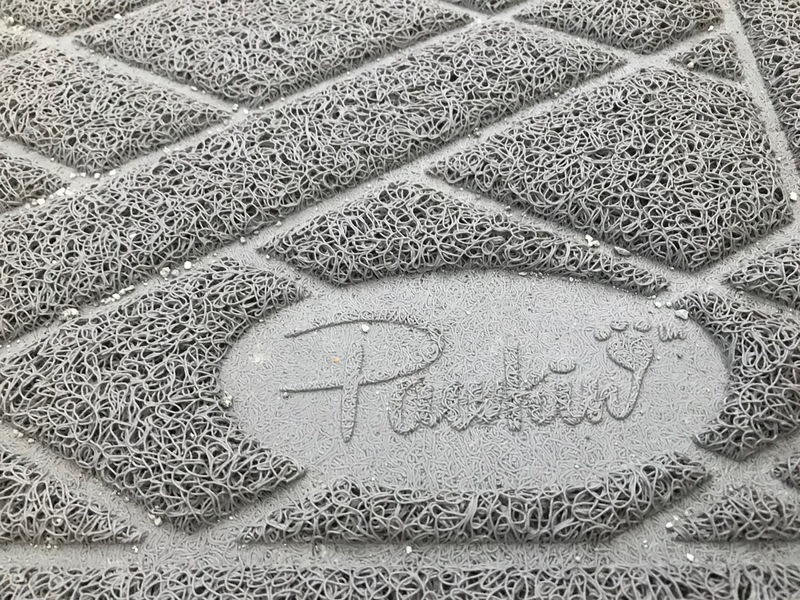 The Pawkin Cat Litter Mat is soft to the touch and our cats didn’t have any reservations about walking on it. 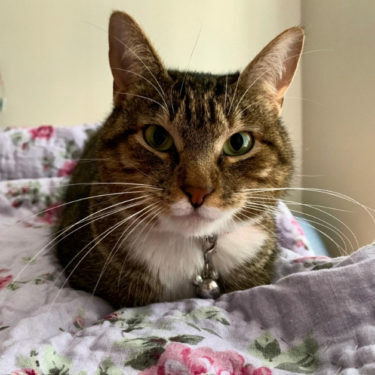 One of the main drawbacks of having a woven mesh mat like the Pawkin Cat Litter Mat is that they are incredibly difficult to clean if your cat manages to track poop or pee on them. Shaking out the mat and vacuuming it won’t be enough to get it clean. You’ll have to thoroughly soak and scrub the mat to sanitize it. From experience, this is a very time-consuming chore. Fortunately we’ve only had to do this once. 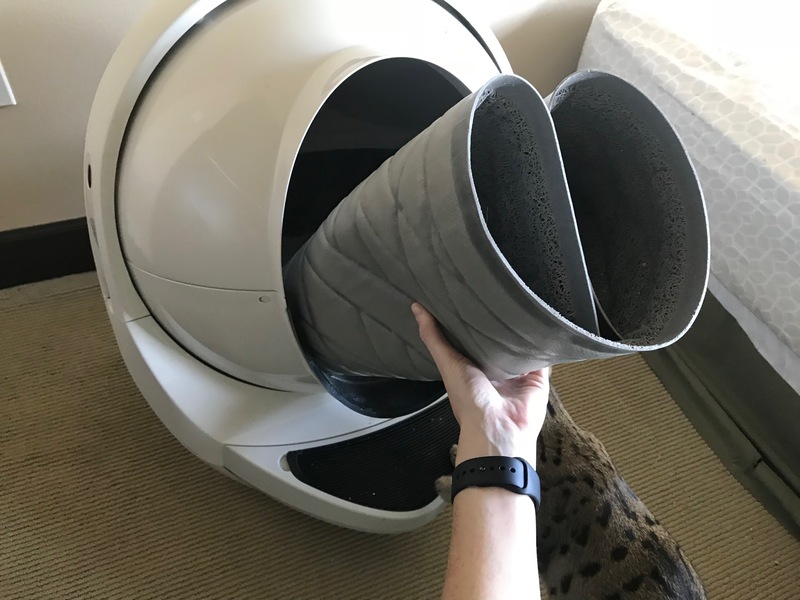 If your cat has a habit of making a mess outside of the litter box, you might want to consider getting a litter mat that is easier to clean, like the Smiling Paws Pets Litter Trapper Mat. Pawkin’s Litter Mats are available in two large sizes. The smaller of the two sizes is larger than average and works well in most situations. 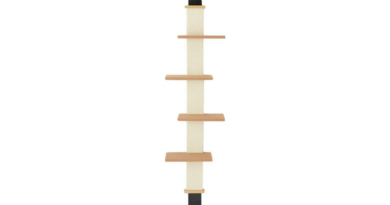 The XXL size is ideal if you want to place your litter box on the mat and have plenty of room around it to spare. 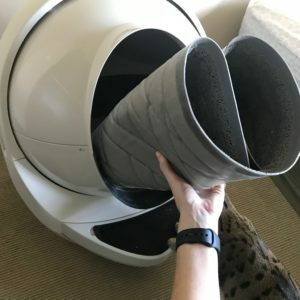 It is also large enough to accommodate two litter boxes placed side by side. 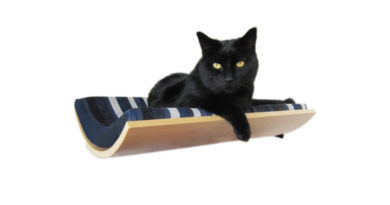 This litter mat is thin enough to be slid partially underneath a litter box without compromising stability. 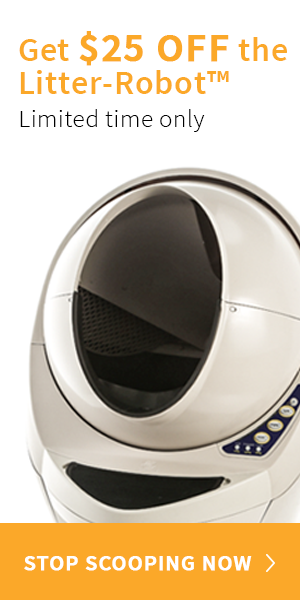 We have ours partially underneath our Litter-Robot and it works great. 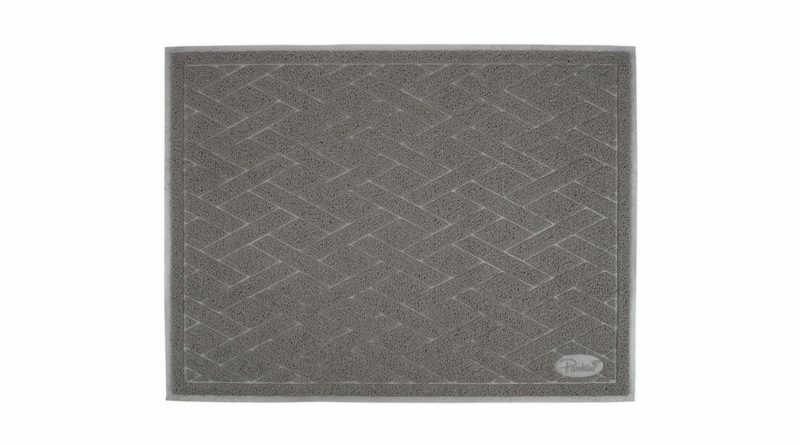 There are a lot of similarly designed woven mesh litter mats on the market. But they aren’t all of equal quality. When compared side-by-side with the Gorilla Grip Litter Mat, the Pawkin Cat Litter Mat is the clear winner. It is made of higher quality material. It is thicker and sturdier than the Gorilla Grip Litter Mat. And the woven mesh does a much better job at trapping litter. 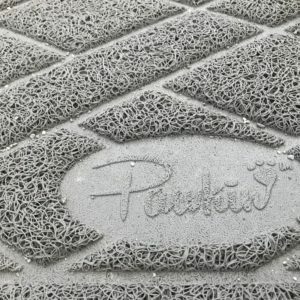 Pawkin stands behind their product by offering a 100% money back guarantee on all of their litter mats. The Pawkin Cat Litter Mat is a top-quality litter mat at a very reasonable price. The patented litter lock mesh really does an excellent job of trapping litter. 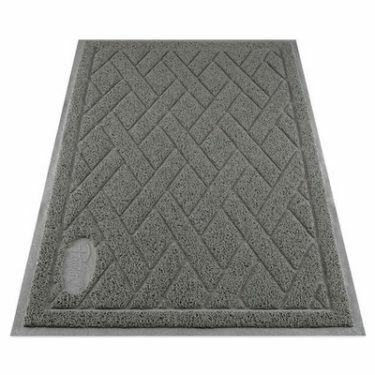 With two large sizes and a variety of color options to choose from, you really can’t go wrong with this litter mat.